After the Great Famine of Horizontally Striped Shirts of the mid-noughties I seem to be incapable of not buying them when I see them in stores, and this ponte number from Country Road is a firm favourite. It’s the lovely, long, tapered sleeves that made it a winner when I tried it on a few weeks ago, and the lighter stripe makes it a good trans-seasonal number for spring. Funny story about this outfit. I was waiting to use the bathroom in a shopping centre and two little girls – maybe 4 and 7 – were also waiting with their Mum. The younger gasped when she saw the hot pink shoes, and said “I like your shoes are you wearing tights?” and when I leant down to show her that, yes, I was wearing stockings my necklace swung and caught the old sister’s attention who grabbed it to take a closer look. Their poor mum was a bit mortified (“we don’t just GRAB strangers!”) but as far as I’m concerned it was officially a Very Successful Outfit. I bought her when I visited the (wonderful) recent “Cat Market” with my equally crafty and cat-mad friend Fi from Fisha Designs. She’s been hand stitched and embroidered, with dainty little eyelids and a jangly bell around her neck that chimes when I move. 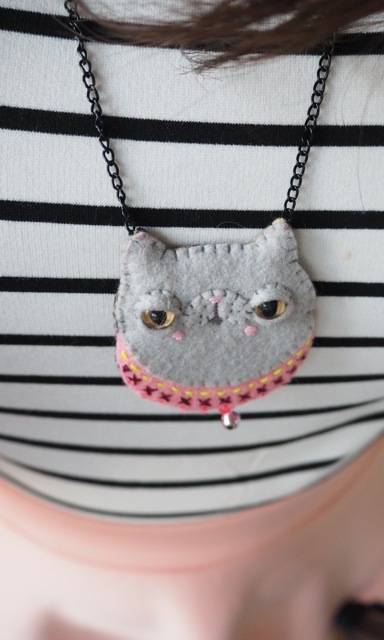 And if you’re not a cat person (it’s OK, I won’t judge you) there’s an equally cute “LiBEARian” necklace on offer in Cat’s shop right now. 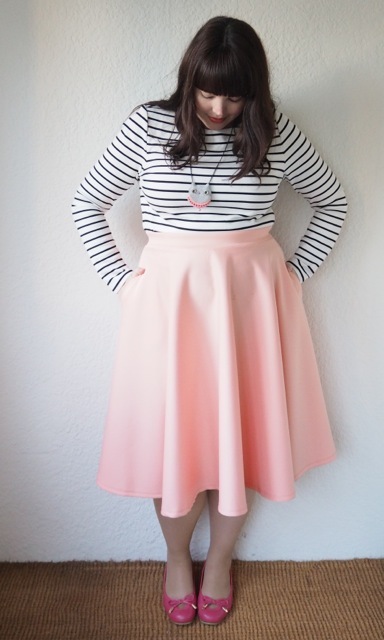 This entry was posted in Uncategorized and tagged asos, comfortview, cool, country road, etsy, skirt by lillipilli. Bookmark the permalink. You made those little girl’s days! I bet you have become their “when I grow up I’m gonna dress just like that” muse! I had a similar muse as a kid, with one of my mum’s friends who always dressed like I imaged I would when I was 20 ( I was 9, 20 was OLD!). She wore dresses over trousers and a green leather jacket, and she had the most amazing fimo (remember that stuff?!?) brooch. I commented on that brooch EVERY time I saw her wearing it! Eventually she gave it to me, I think now just to shut me up. 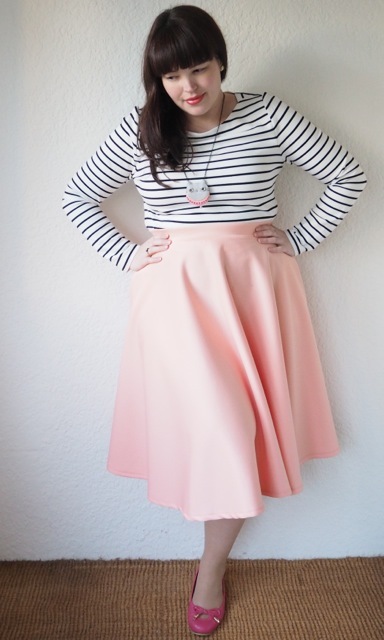 There has been a distinct lack of breton tops in uk over size 20, so I’m envious of your top! Thanks Claire! My “Auntie” Celina (my uncle’s then girlfriend) was probably the most stylish person I knew growing up, too. She gave me a malachite ring I coveted, though God knows where it is now – I wore it obsessively into my teens! How would you rate those shoes in terms of comfort and support? They look super-cute and I’m hoping they rate high enough for me to get a similar pair! Hi Kristy, I really love them actually. There’s a proper sole on them so they’re comfortable for city walking, they don’t rub the skin off my feet, so I can wear them without socks, and they’re suitable for a wider foot. The innersole’s a little squooshy, but it doesn’t have any arch support or anything though. I must know – what brand/color of lipstick are you wearing? It’s lovely with your skin and hair tone. YOU are simply lovely! LOL, yes! The time difference strikes again! 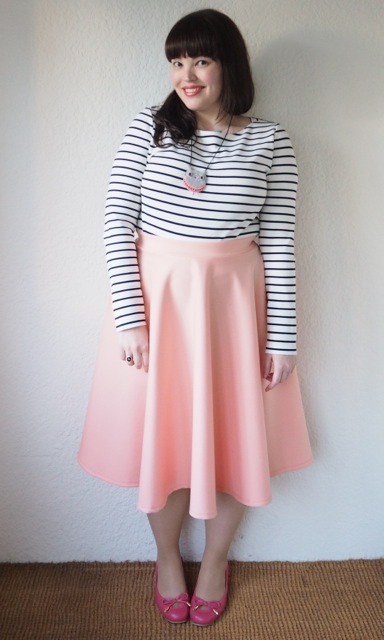 I love the peach skirt and the pink shoes – your colour combinations are really inspiring me to try new matches these days! And great story about the 2 girls 🙂 When I was little I would have been much too shy to say anything, but I loved staring at people’s jewellery and shoes.